First of all - THANK YOU all so much for the well wishes! It's just another reason I love this community so much. I would love to thank you all in person, but it would seriously take me all day long - but just know I appreciated every single comment. I have to say, while I intend to keep my promise of not turning this into strictly a pregnancy blog, it is such a relief to not have to keep that secret anymore! Secondly - was anyone else's weekend too short? Man, the time flew by this weekend. Then again, we were pretty busy, so I suppose that is part of it! And thirdly - it's Inspiration Monday and well - I did another "if you blink" type inspiration outfits, mostly because of the weather than anything else. Here is Lauren Conrad in a very cute summer dress and hat. And here is me all bundled up because it's not going to be all that warm today! Seriously, yesterday it didn't get out of the 60's. Today I think it's only going to be about 70. And it's June? Yeah, that's been the name of the game around here lately though. We seem to be one month behind weather wise this year. Or maybe we skipped ahead to October. It feels almost fall like in the air! So for anyone curious, a large majority of my clothes still fit which is pretty nice. The good news is, I have a ton of flowy sundresses like this one that are going to allow for growth as I get bigger this summer. And peasant tops seem to be in this year, so I've already bought a few in slightly larger sizes than normal. I am trying to not shop too much if I can help it, or I've stuck with my consignment shops/thrift shops for anything I have bought so far. And I did splurge on this bag. Kind of a treat for myself after a bad day a few weeks ago. I had seen this bag with Megan from Feathers and Freckles and I realized it just might be the perfect bag ever. I'll talk more about it in another post though or we'd be here all day! I think June is going to fly by. We have a busy schedule with our music group. The Pants Monkey and I are also re-taking golf lessons once a week to work on our skills some more. We're trying to somehow get ready for and find time for a garage sale. I'm helping out a good friend and hosting a 31 Party. And in the midst of all that, I also get to call in and see if I actually have to report for Jury Duty next week. Yes, that's right, I was summoned. Nothing makes you feel more like an adult than getting summoned for Jury Duty, I'll say that much! Whew. So there you have it. It's all happening friends. This baby isn't slowing this chick down, that's for sure! For more Inspiration Monday outfits, head on over to two birds over here. That's a really cute dress! I know what you mean about the weather though. I'm wearing a brightly colored maxi dress with a cardign. This weather just stinks! So excited for you! It's the perfect time to be pregnant since you can wear all the cute summer dresses. I really like this outfit and the purse if pretty awesome too. Our month is going to be busy for June. It's never ending! Again - so so so happy for you! Congratulations!!! I am so excited!!! This is the best news ever - you just made my Monday, B! Wow! You have a full agenda all while growing a person. You are a woman! You can multi-task! hahahahaha. Golfing while expecting? Wow. You are going to be loving the weather in MN when you are at the end of the 40 weeks. You are pregnant at the right time. AND ...once again, congrats! I adore that dress beyond all reason and I agree, that bag is epic! Lol! BB is just gonna have to get used to the busy life. 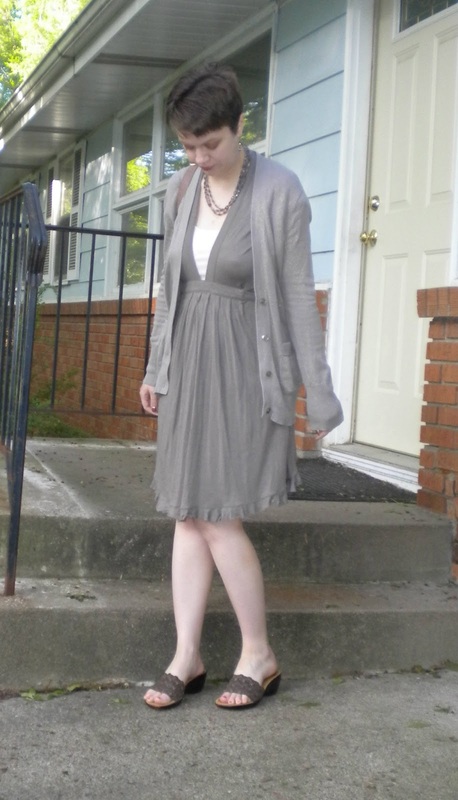 Love the soft greys of this outfit. Lucky you, not having to be heavily preggers during the hot summer! You are a vision in taupe! I love the dress and the bag! What a pretty monochromatic look! That bag is gorgeous! that dress will be perfect for a growing belly! !